It happens. Sometimes we are in situations where we have to lend our vehicle to other people. Maybe you are not fit to drive and give the keys to someone who can. Maybe your family member needs to use it when moving items around. Regardless of the reason, you probably are a little cautious before letting someone else drive your car. After all, there are major consequences that can arise if something bad were to happen. Take a look at what you should be aware of the next time someone asks to borrow your car, even if it is for a minute or two. While this is common sense, we still highly encourage drivers not to lend their keys to someone they do not know. Even if they are a good friend, make sure they don’t have a history of getting into wrecks. Because the second they get behind the wheel and take your car on a joy ride that ends unfavorably, you are going to be the one at fault. Regardless of the fact that the person driving your car has insurance, it is not going to be their agency that covers the wreck. It will be yours since your car is covered through your agency. While the driver’s insurance may cover things like personal injury or medical expenses, you will still have the majority of the bill to take care of. If it turns out that someone borrows your car more than occasionally, especially someone that you employ, get in touch with your agency to add them onto your policy. While it is true that there are major consequences that can occur, this is really just for worst case scenarios. More than likely, you will be covered if you give someone verbal consent to drive your car. If you are nervous, feel free to give your agency a call to make sure all your bases are covered. 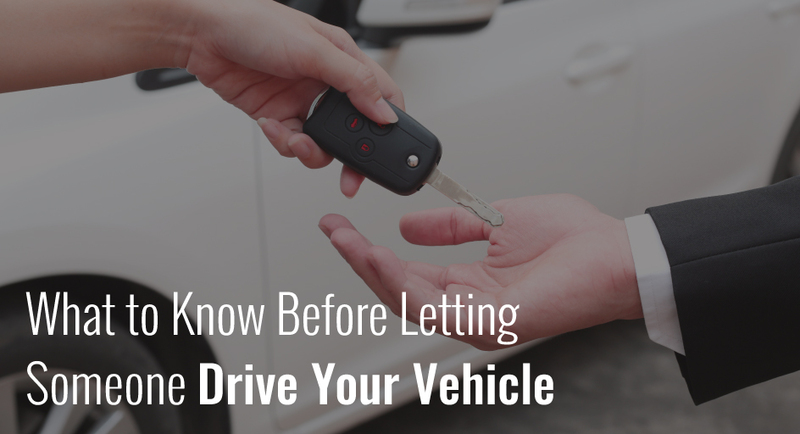 They will be more than happy to guide you through the do’s and don’ts of lending your vehicle. If you ever have any questions about your auto policy, don’t hesitate to get in touch with our agency. We are always here to help make life (and insurance) a little less complicated.